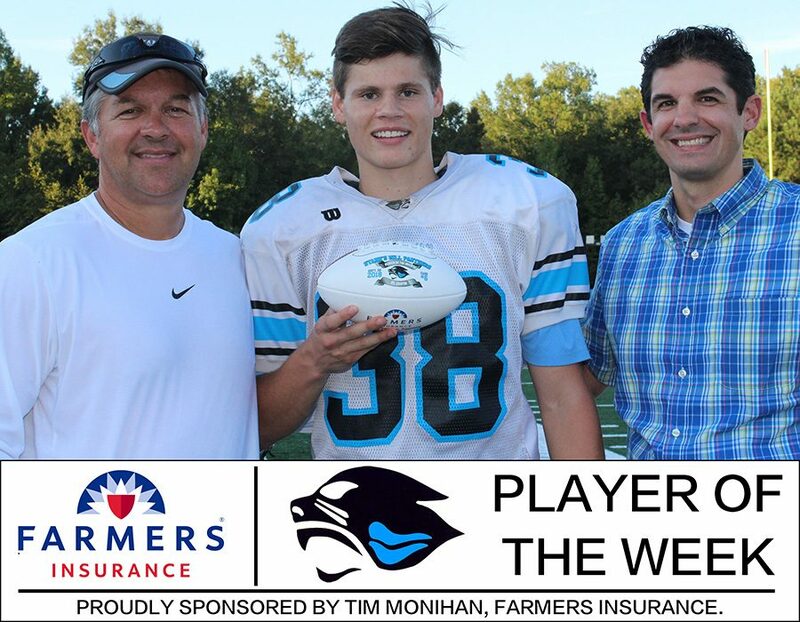 Tim Monihan and Farmers Insurance have presented senior kicker Michael Lantz with the ninth Player of the Week award for the 2018-2019 school year. Lantz was one for one on field goal attempts in the Panthers’ 38-6 win over Griffin. On the season, Lantz has made five of his nine field goal attempts and is 23 of 23 on extra points. On kickoffs, he has forced a touchback on all but three kicks. The senior also averages 37.1 yards per punt. Starr’s Mill travels to Whitewater tonight for a matchup against a Wildcat team still looking for its first win of the year. Following a 14-0 loss to Jonesboro, Whitewater needs a bounce-back win to keep their playoff hopes alive, and upsetting the Mill would rattle region standings. The contest is at 7:30 p.m. at Whitewater High School.